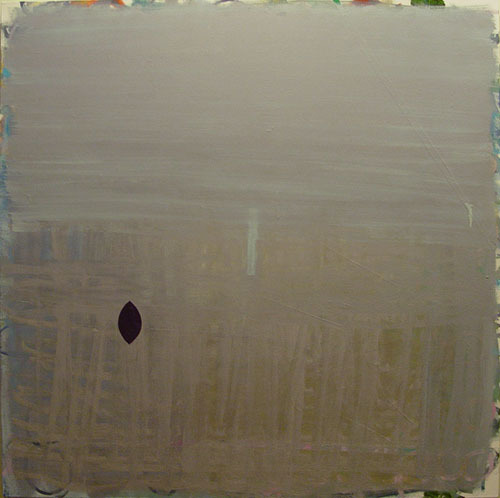 I just finished a couple 36” square paintings. And I’m still digesting them. I hope to do some more of that size but first I am going to shift over to works on paper. Ideally I like to shift back and forth, keeping both surfaces, or ways of working, in the same conversation. Sometimes though, the idea that I know what the conversation is seems contrived. 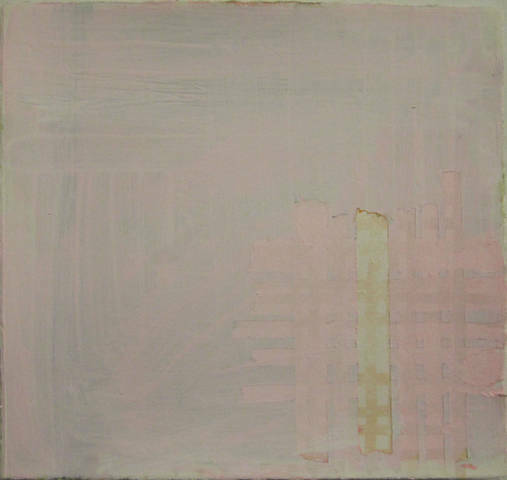 Perhaps the paper, being a different size, substrate and applied with different media should be different? I am less interested in a consistent body of work these days. I always start with a pot of tea tucked under a painting rag like a tea cozy and from there one of the key features to my routine is a battle or dance between focus and distraction. I am attempting to start my painting day with some meditation to help bring a more rooted clarity to my practice but my desire is to straight away pick up a brush and start painting. Anything that gets in the way of that frustrates me. That said, my focused painting periods are rather short. I get distracted. I spend a lot of time in contemplation. I zoom in and out of engagement with the work. 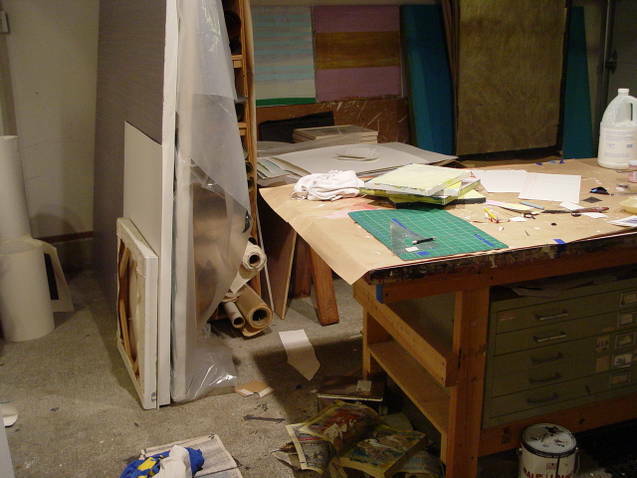 My studio is a 400 square foot garage in the back yard. 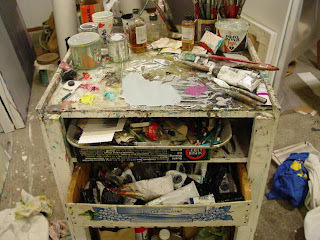 There is a 10 by 3 foot table down the middle where most everything ends up, a rolling cart for a pallet and, near the door, some shelves and a small cabinet also with piles on it. There are piles on the floor as well. On rare occasions I clean. 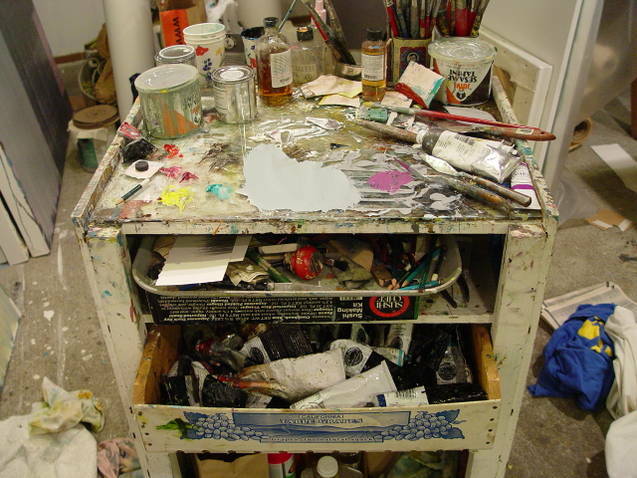 The chaos and the order IS the studio. It is ideas building and flowing and a grand excuse for a mess. A blank canvas is an opportunity to play. At this point I am not much burdened with what I mean to say. I lay down paint as if it mattered but knowing I will cover it up. It’s an unfettered beginning. I start a new piece with a synthesis of ideas derived from art I see, visual input from walks, abstract notions of chaos and order. 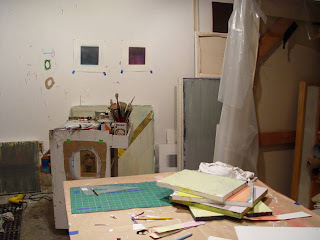 I may be aiming toward a certain color or light, a relationship to the edge or a desire to use tape. I don’t think it through much. The big angst is the falling in and out of love along the way. I will fall in love with a color combination layered just so or the way the edges are happening or a texture and t hen I think the painting is done. I’m elated and then some time passes, a day, a week and I can’t understand why I thought the painting was any good. So I paint some more, fall in love again and most likely repeat the same elation and humiliation/defeat. It’s such a crazy ride. Currently what engages me is an unfinished, vibrant, and clunky beauty. To get there I need to keep the path open ended. I need to have as few rules as I can bear. The value of art. The value of my voice. The value of metaphor. The value of the repeated gesture. These things have tremendous value and worth but than again not so much. I’m very interested right now in small, abstract tantric images. I am interested in the backgrounds they used and manipulated, the relationship of the image to mantras, and their ability to jump beyond their cultural context. I’m having trouble resolving meaning. Working on canvas I usually stick to oils. I think incorporating other materials takes a plan, a calculation. I have to think about what I can do under and over a material. I don’t know what I am going to do next so don’t know if the other material will work. Working on paper my material selection is opened up. I have used tea, flasche, gouache, watercolor, inks, latex, spray paint, sandpaper – anything but oil. A couple of my new paintings are in a December group show and I will have my own show coming up in February both at Gallery IMA in Seattle. 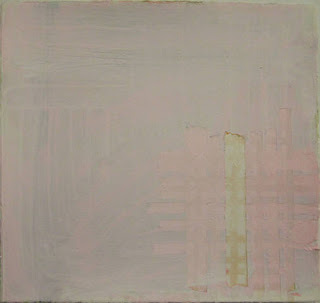 It will be a combination of paintings form 2011 and drawings from 1999. In the studio I could head different directions within the vein I am currently mining. My goal is to keep redirecting my focus, my activity and attention, to the background. Pretty nice work. I like it a lot. Good color sense and the cascades opposite the hard edges are a nice touch. Love the studio. I enjoyed reading this and see also that we share similar studio spaces (garage) and style (chaos) but arrive somewhere different. Really like to see the evidence of process in your work. best of luck with your shows, Julie.